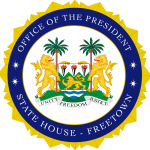 State House, Freetown, Wednesday 10 April 2019 – Members of The Body of Christ Sierra Leone have met with His Excellency President Julius Maada Bio at State House to commend him for his remarkable approach to governance one year since his election as President of Sierra Leone. President of the Pentecostal Churches, His Grace Bishop Archibald Cole, said as moral guarantors they were biblically mandated to engage the leadership on a time-to-time basis, with the aim of ensuring development in the country, noting that they were delighted at the prospects of developments based on efforts the government had made so far. He described the launch of the Free Quality Education programme as a laudable step by the government, adding that that would lay a perfect foundation for development and as well provide opportunities for the less privileged in society. He also commended the President for his stance in the fight against corruption, saying that corruption was an impediment to the development of the nation. “Your Excellency, we take this opportunity as the Body serving as moral guarantors in this nation to assure you of our readiness to work with you and your government in the New Direction. It is on that note that we wish to put on record our heartiest and sincerest congratulation to you and your government for banning masquerading of mask devils along our streets during Holy days and holidays. “We are highly gratified, again, by your government’s recent banning of initiation into secret societies and it is our hope that such a ban will go a long way in respecting the human rights of citizens in this country. I salute you on the great strides you have taken in the fight against corruption and the results so far achieved. The successful launching of the Commissions of Inquiry is demonstrative of the positive efforts you have personally invested in fighting this cancer in our society,” he said. He said another gratifying effort was the President’s clarion call for action against the high incidents of sexual violence, especially the sickening malaise of adult men abusing innocent girls and children, saying that they were in full support of whatever action being taken to curb the menace. On his part, President Bio said he was happy to meet with members of the faith-based group, adding that as spiritual leaders they owed a lot to the country. He said his government was involved in many activities because, for far too long, a lot had gone wrong. He noted that there was a need to recover from those wrongs, which required collective work and energy. He said the need for providing quality and accessible education could not be overemphasised. He reiterated his belief that the Free Quality Education programme would only be successful with the involvement of everyone, noting that parents were integral to the initiative because they play the moral guarantors’ role. He stressed that the universal access to education for pre-primary, primary and secondary education policy should not be seen as a programme exclusive to the government but should be considered as a project that belonged to the people. President Bio also mentioned that few individuals had labelled his fight against corruption as a witch-hunt but he emphasised that he had a clear conscience that the fight was in the best interest of the country, noting that development would not thrive where there was corruption. He stated that by closing the financial loopholes in the country, his government had been able to achieve a lot by internally generating huge resources to support social programmes. “The fight against corruption is not about any one person. It is also about us sitting in positions today because we know someday we will be called to give an account of our stewardship and that in itself is a deterrent. We are serious about this fight and there will be no sacred cows. The fight is something we cannot do alone, so we need you as spiritual leaders to be preaching about it in your different platforms. Your voices are not small and you can make an impact,” he urged the religious leaders.